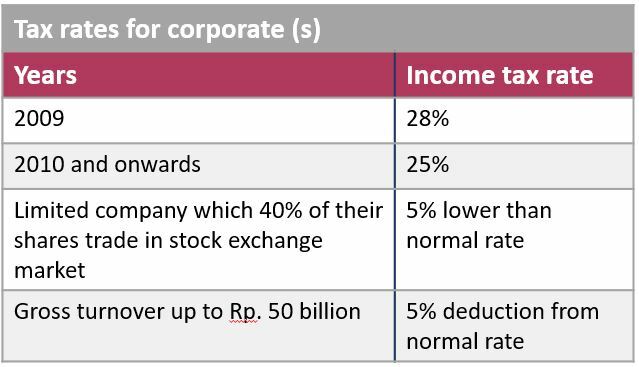 The basic tax obligation is Income Tax (Pajak Penghasilan or PPh) which is progressive and applied to both individual(s) and enterprises. A PT. 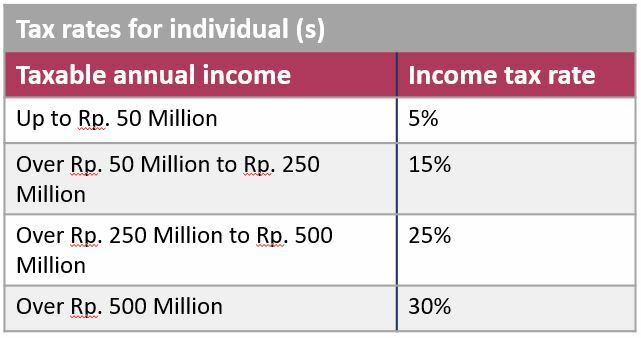 PMA that is located and carries out business activities in Indonesia and foreign individual who is working and earn income in Indonesia generally have to assume the same tax obligations as resident taxpayers. A self-assessment method is used to calculate income tax. Withholding Tax (Pajak Pemotongan) system is used in Indonesia to collect the income tax. Where a particular item of income is subject to withholding tax, the payer is responsible for withholding or collection of the tax. For example, employers are required to withhold income tax of the salaries payable to their employees and pay the tax to the tax office on their behalf. Detailed information on Income Tax should refer to The Income Tax Law No. 36 of 2008. The owners of land & buildings have to pay tax annually on land, buildings and permanent structures. The effective rates are nominal, typically not more than one tenth of one percent per annum (0.1%) of the value of such assets. 1.Capital goods in the form of machineries and factory equipment, either in installed or separated, including spare parts. 2.Feed of poultry and fish and raw materials to make feed. 3.Seed and/ or seeding of agricultural material, plantation, forestry, livestock, aquaculture, or fishery. These tax ranges from 10% to 75%. The list of the tax should be referred to The Government Regulation No. 12 of 2001 jo. No. 43 of 2002 jo. No. 46 of 2003 and other related tax implementation regulations. The stamp duties nominal are either IDR 3,000 or IDR 6,000 on certain documents. The rate of IDR 6,000 is applicable for letters of agreement and other letters, such as Notary Deed and Land Deed including its copies. For all documents bearing a sum of money, the rate is IDR 6,000 when the value stated in the document is more than IDR 1 million, and IDR 3,000 when the value is between IDR 500,000 and IDR 1 million. Below IDR 500,000 is not subject to stamp duty. For cheques, the rate is IDR 3,000 regardless of money value stated. Applicable for Trade Representative Office in Indonesia. Decree of Directorate General of Taxation, KEP-667/PJ./2001, states that deemed withholding tax for Trade Representative Office is payable at the rate of 0.44% out of 1% gross export value. This is only applicable to foreign taxpayer that has no double-tax treaty agreement. For more information of the payment details, please refer to Directorate General of Taxation Circular No. SE-2/PJ.03/2008. Tax aside, local government at provincial or municipal level sometimes apply retribution for some business sectors. It varies from each region.